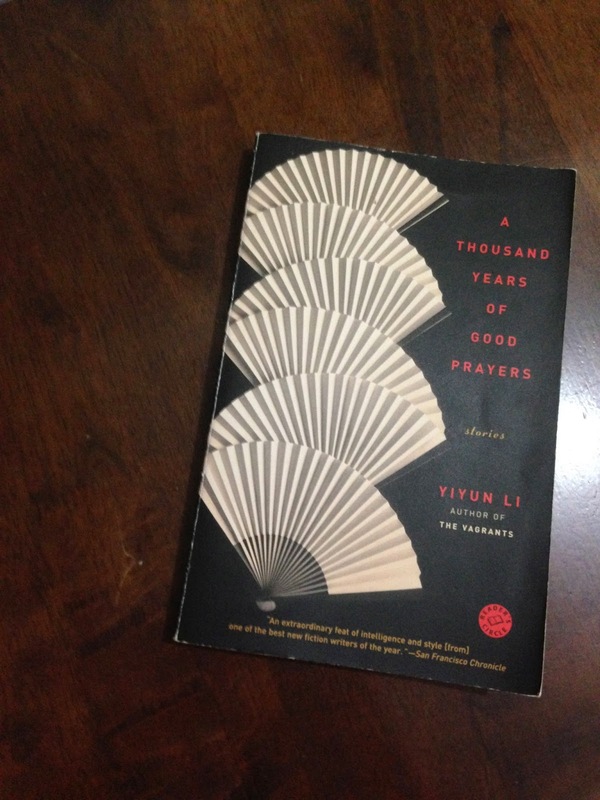 A Thousand Years of Good Prayers by Yiyun Li is one of the books that I was dared to read this year, courtesy of the book club's I Dare You To Read year-ender/welcome activity last January. A short backgrounder: participants to the activity were asked to name one Best Read and one Worst Read for 2013 (if they could bring their print copies or share digital copies of the books, that would be even better), and then everyone gets to pick one title each from the collated Best Reads and Worst Reads lists, which he/she will be "dared" to read within the year. A Thousand Years of Good Prayers is the book I picked from the Best Reads list, which my good friend Benny cited as one of the best books he’s read for 2013. Knowing his penchant for remarkable literary works, I'm glad I picked it, even if I had no idea what the book was all about. It's the first time I've heard of both author and book, so I didn’t know what to expect. It wasn’t a book I would pick up on my own volition or give a second glance sans recommendations, taking a chance that I won’t be wasting my time or money. Thanks to the book club's activity (and Benny, of course! ), I was given a chance to acquaint myself with this exceptionally talented author whose roots are from China. And what better way to get to know Yiyun Li than through this collection of short fiction, each one full of heart and nostalgia and raw emotions, they're just too good? There are 10 stories in this collection, all of them about Chinese people – both in their native China and in the United States, as immigrants. All of the stories are replete with Chinese culture, tradition, myths, and history, and all are so poignantly told that it felt like silently communing with the characters. They reminded me of the stories of Jhumpa Lahiri, who wrote about immigrant Indians in the United States and whose award-winning short fiction are guaranteed to tear at your heartstrings. But Yiyun Li is notable and brilliant all on her own. While Lahiri’s prose is quietly elegant, Li’s writing has a certain charm in its simplicity and straightforwardness. I would hazard a guess that English is only her second language, being originally from China, and if this were true, then her prose must be given credit for its clarity and precision. I am looking forward to reading more of her works. My three favorite stories from this collection are Immortality, After A Life, and of course, A Thousand Years of Good Prayers. Immortality told about the Chinese eunuchs of old, the regime of the Chairman Mao or the "dictator" and Communist China, and a simple, bereft young man who unwittingly achieved immortality because of the fusion of these two important aspects of Chinese history. After A Life is about a couple who got married against all odds – they were first cousins, after all, and they went against the advice of their elders – and had two children, one of them afflicted with cerebral palsy from birth and had no chance of living a normal life. Finally, A Thousand Years of Good Prayers is about Mr. Shi, a rocket scientist, and the distinct relationships he shared with two women in his life: his shaky relationship with his divorcee daughter, and the companionship he found with a non-English speaking woman retiree with whom he shared stories of his life. In all these stories, I was extremely moved by the personal battles and struggles that the characters endured, and how they coped and attempted to survive in the ways they knew how. There's a reason for every relationship, that's what the saying says. Husband and wife, parents and children, friends and enemies, strangers you bump into in the street. It takes three thousand years of prayers to place your head side by side with your loved one's on the pillow. I really liked Immortality. It's the most memorable story in the collection.